Independence Day has a myriad of party planning opportunities. By the time July 4th hits, summer is in full swing. School is out, graduates have walked, pools are crowded, and gardens grow. People are ready for a good bash. 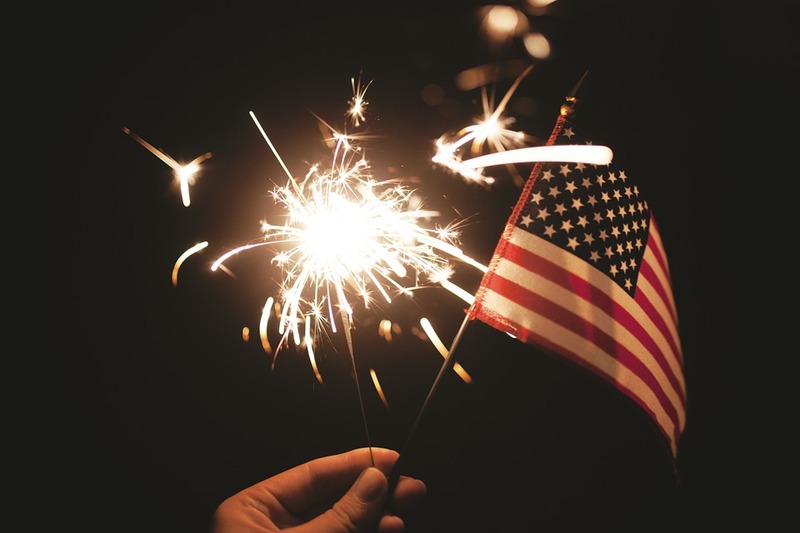 And Independence Day does not disappoint with its myriad of party planning opportunities: a red, white, and blue color scheme, a festive patriotic theme, plenty of fresh produce, and outdoor cooking options. First think about the venue: backyard, lake, beach, mountains? Where the party takes place helps determine food planning. Many Columbia families congregate in a home or condos at the beach. Designating who will bring what enables members to make dishes ahead of time so the July 4th holiday can be enjoyed instead of spent wilting in a kitchen. And those planning for a lake celebration might consider the logistics of food hauled into a boat. It is a good idea to cut, marinade, cook, prepare, portion out, etc. as much food as possible into zip-lock baggies or some sort of plastic containers. Keep raw foods separate – if possible in a different cooler – from other foods and drinks. Store food in an adequate cooler that will hold its temperature to ensure nothing spoils. Plus, fill a bag will all kinds of serving and cutting utensils that might be needed. 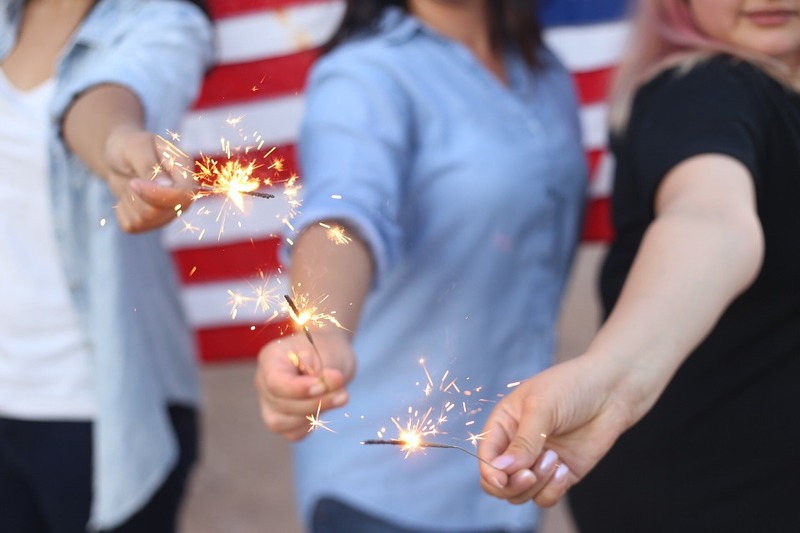 Bring together friends and family for a festive 4th of July bash! – Do an email invite (or download a free printable one from various sites) that alerts guests to what will be served by you – and then ask them to bring something specific: drinks, paper products, a side dish, their choice of meat for the grills. If you do not have enough chairs, state on the invitation BYOC – Bring Your Own Chair. – Since our city is “famously hot”, supply home-made accordion-style fans made with red, white, and blue construction paper. Plug in some oscillating fans on the patio or deck, and throw some inexpensive washcloths in a bucket of ice. 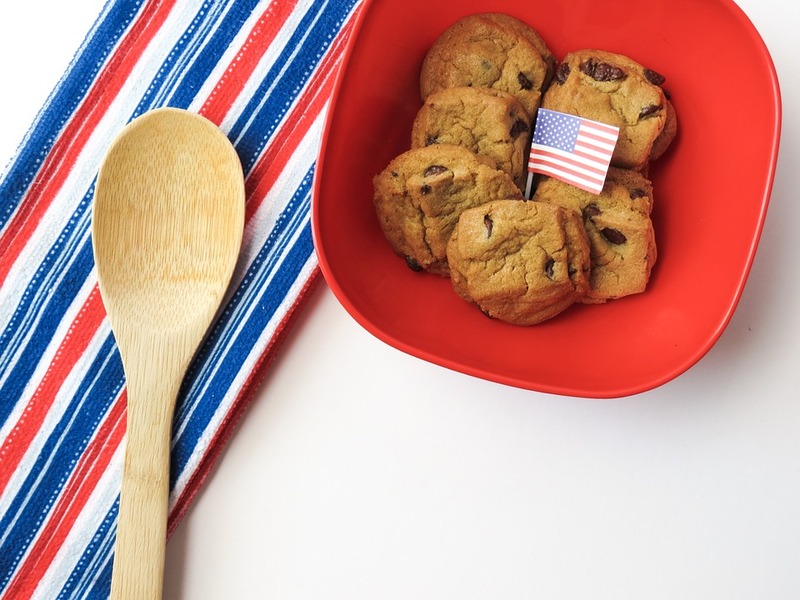 Pull together clever, creative edibles that convey a patriotic theme. Set up an ice cream bar with red, white, and blue sprinkles and candy stars for a colorful, festive treat that will delight young and older alike. Light up the grill for tasty 4th of July meals. Concerning grilling, it is a matter of preference whether a gas or a charcoal grill provides the best flavor. Clean before guests come, and soak a paper towel in vegetable oil and rub on the grill Pre-heat the grill up for about 15-20 minutes. The temperature of the grill depends on what is being cooked, but the goal is to sear meats and keep the inside moist and juicy. Invest in an instant-read fork thermometer to learn when meat is cooked. Grill baskets are great for vegetables, shrimp, fish, etc. Prevent flames by trimming fats on meats; keep a spray bottle handy if flare-ups occur. When it comes to decorating for Independence Day, choices span from easy DIY to elaborate and novel. Specialty party retailers as well as discount stores have the party planning in the bag with banners, buntings, and even hats coordinating with tableware and party favors. Or, go all-out with red, white, and blue paper lanterns, candles, flower arrangements with mini flags, pillows, and/or decorative signware. For a bold statement, make a large stencil of a star out of poster board or a flattened box and spray paint red white and blue stars on a freshly mowed lawn. Drinks are an easy way to present the day’s theme and can serve as decoration for the table. Simply fill a tub or large bowl with red, white, and blue sodas, juices, or sports drinks. Filling bowls with red, white, and blue fruit also decorates a table covered in a simple white table cloth. For smaller get-togethers, consider offering baskets of party favors; inexpensive patriotic-themed t-shirts, beach towels, handkerchiefs, glow sticks, koozies, and water bottles can be purchased at discount stores. 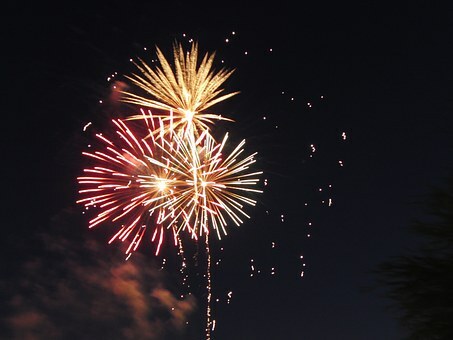 End your 4th of July celebration with a fireworks finale! No party is enjoyable if there are swarms of mosquitoes and pesky gnats or flies. Prior to an outdoor party at home, have the yard sprayed or make sure to empty any standing water and keep all areas dry for at least a week before the event. Have bug guard towelettes or bug spray available, or go the natural route and mix up some insect-repelling lavender and olive oil for guests to rub on. Rosemary on the barbie – in sprigs or on meat that has marinated in it – mixes with the smoke from the grill and is also considered offensive to mosquitoes. Avoid glassware; it and parties do not mix well. Instead, use paper, plastic, and Styrofoam. Environmentally conscious-minded hosts can set up both a recyclable trash can and a regular trash can in a prominent area. 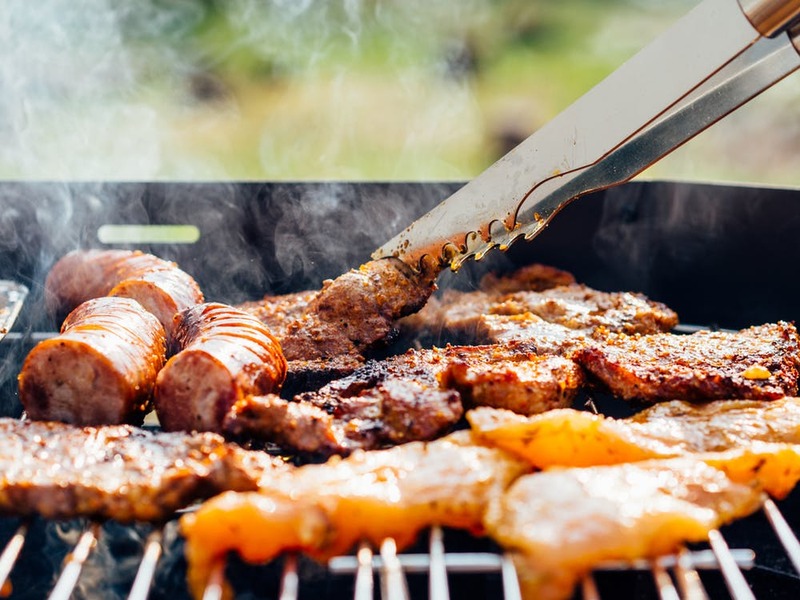 With more than 8,000 grill-associated fires annually, according to the National Fire Prevention Association, it is imperative that there be a fire extinguisher nearby while grill is in use. Double check gas grills to make sure gas is turned off when grilling ends. Keep little ones away. Ahead of time, make sure gas lines from tank to grill are secure and that there are no cracks or leaks. Do not spray non-stick spray onto a grill rack. Finally, always have a first-aid kit handy. Learn prior to parties if any guests are allergic to peanuts, shell-fish, and bees, for examples. If so, make sure they have their EpiPen handy just in case. And, if sparklers are one of the scheduled activities, have a metal tray or bucket handy where extinguished ones can be placed so no bear feet are scorched. July 4th is a true day of celebration in honor of tremendous fervor for this great country. Enjoy – no matter where you find yourself this holiday.